Oh, come on, you’re thinking. I’m still running my AC here and there. You want me to start thinking about my heater now? I am not ready to start thinking about the winter yet! Well, that’s the whole point. It’s still relatively warm out. Nighttime temps will be dipping pretty low, pretty soon. But for the most part, the chill of the autumn season is barely being felt—let alone the chill of winter! So why should you be thinking about your heater tune-up at this point? Because it’s a preventative measure. The purpose of heater maintenance is to help prevent the need for heater repair in Voorhees, NJ. That means that you don’t wait for something to go wrong before scheduling this vital service. Will it make your heater invulnerable? No, of course not. Nothing can do that. Will it benefit you in a number of different ways? Well, just read the information below, and you tell us! We mentioned above that heater maintenance can help to keep repair needs at bay. And no, we are not going to backtrack and say it’s 100% successful at this. But it will give you the best shot at as problem-free of a heating experience as you can hope for. 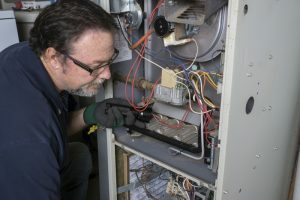 When you schedule routine heating maintenance on an annual basis, you’re giving your system a chance to be put back into great fighting shape. Wear and tear on your system is inevitable. This shouldn’t come as a surprise, when you consider just how much work your system is doing each and every year. By addressing that wear and tear through maintenance, you keep the chances of problems developing due to that wear and tear to a minimum. When you heat your home, you want to do so effectively and reliably. But that doesn’t mean that you want to be paying an arm and a leg to do so. You want peak results with minimal expense, and that is what you can count on when you schedule routine heating maintenance service. If your heater is not maintained, it may still work decently. For a while, anyway. Even if the system is up and running, however, it may not be running as efficiently as possible. Don’t let high heating costs become the norm. Instead, let us tune-up your system for maximum efficiency levels. A heater that is not operating properly is a heater that is not operating safely. Anything from electrical issues to gas leaks can result from unsafe operating conditions. Does this mean you shouldn’t heat your home, so that you can live safely? Of course not. It does mean, however, you need to schedule regular tune-ups with trained professionals, so that you know for certain your heater is functioning safely. It is just not something you can afford to take any chances with. With our team on the job, you won’t. Schedule your heating maintenance with Climate Mechanics LLC.